The history of fencing thought is a history of thought directed to a single purpose: how to most effectively place a sword into an enemy’s body to produce the most damaging results without being hit at the same time. It is a history of observation, inspiration, and innovation. Today, we take for granted that fencing is based on logical behavior and thought. Fencing is sometimes referred to as physical chess. But this has not always been the case. Over the centuries, there has been much struggling toward a hoped for perfection in swordplay. Fencing systems have been created, defined, added to, subtracted from, refined, redefined, and re-created, thus coming eventually to its present state in the world. Ancient Rome, with its flair for organization, brought systematic structure to sword combat, both in the personal clashes of its gladiators, and in the military actions of its legions. Gladiators, who were often slaves or criminals, were taught in special schools called Ludi, by professional instructors, called doctores. There was, in fact, a large body of specialized fighting knowledge to be mastered. Roman soldiers were drilled to fight and maneuver as a single-minded unit, but a practical form of hand-to-hand combat was also geared to the legionnaire's short thrusting sword. New recruits were exercised with dummy swords twice the weight of real weapons. The 1st century B.C. Roman historian Livy describes a sword duel between a Roman officer and a huge Gaul, in which the trained soldier merely blocked a single cut from his enemy's blade with his shield, pushed aside the opposing shield with his own, and ran his opponent twice through the groin, killing him instantly. The Roman mind was both straightforward and efficient in battle. But, with the demise of the Roman Empire in the 5th century A.D., that profound structure and sense of order was sadly lost. Knights wore armor, and made it a primary part of their defense. The sword was thought of as an offensive tool, the purpose of which was to make its way through armor. Among the lower classes, however, where armor was not even a thought, punching, tripping, tumbling, kicking, and wrestling were all part of the common swordsman’s offensive and defensive repertoire. With the advent of the Renaissance, however, men began thinking about efficient movement, both in the way the human body traveled through space, and the way the sword blade might be manipulated to its greatest effect. The devastating penetrating power of gunpowder teamed with muskets made armor obsolete. Thus, new methods of personal protection became a significant concern. There was a conscious and deliberate decision to move away from the unpredictable rough-and-tumble struggles of the past to create systematic and dependable schemes to beat an opponent. But none of these experiments were simply the outpouring of altruistic concern. During the Renaissance, the cult of personality was born. Now, men actively sought out fame and fortune. The individual spirit, once hidden behind society’s requirement for anonymous action, now yearned to be recognized. Some men gravitated to politics, some to the arts, others, of a more contentious and physical nature, saw clearly that the world of the sword was ripe for conquering. Many, looking to elevate their professional standing, devised rich, and sometimes obscure, philosophies to enhance their scholarly pretensions. Moreover, the invention of the printing press during the 15th century did much to establish and spread the newly created doctrines of fencing. Now, students of the sword could study a master’s ideas without the master being present. Moreover, the master’s thoughts remained intact, to be practiced by countless generations, long after his death. 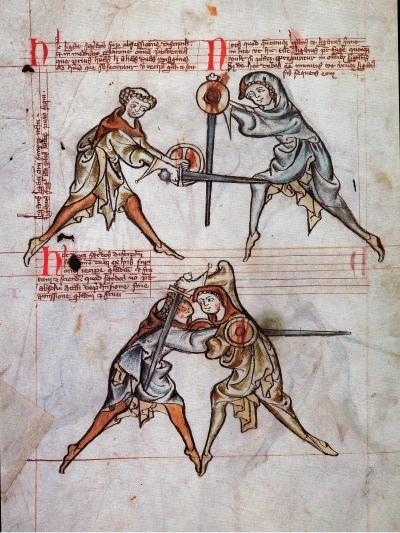 The two-handed sword and the single-handed cutting sword had their days. The Italian, Achille Marozzo, was the first sword master of note to put forth a system of combat that relied on something other than brute force. His book, Opera Nova, first published in 1536, saw a number of editions over the years. Camillo Agrippa used the science of his time to produce a simplified, understandable form of swordplay. Other masters of that time either added to or subtracted from given fencing principles. Fencing thought produced a continual bending, stretching, and breaking of ideas, always based, to some degree, on a particular fencing master’s personal views and impulses. Artifice always raised its ugly head, as artifice does in any age, but artifice produced dead swordsmen, which was poor advertising for any fencing master. Ideas never had time to grow stagnant, though, and fantastic invention rarely became entrenched doctrine. During the 15th century, German thought and temperament produced fencing guilds that helped solidify fencing concepts in that country. These organizations used strong-arm tactics to enforce their will. This may seem unfair, even criminal, by modern standards, yet they managed to instill a continuity and a reliability in the teaching of German swordplay. The invention of the thrusting rapier in the 16th century changed fencing thought dramatically. Whereas combat with cutting swords was generally fought in the round, rapier fights evolved into a linear form. Suddenly, the ability to deliver a sword point efficiently became the prime focus of fencing brain word. Attacking and defending in a straight line was the obvious answer. Although he did not create the lunge, Ridolfo Capo Ferro established this fencing action as the primary mode of delivering an attack; and thus, the first step toward modern fencing technique was made. Published in 1610, Capo Ferro’s Gran simulacra dell’arte e dell uso della Scherma, set the standard for rapier play for many years to come. The Spanish, perhaps influenced by the scientific discoveries of their former Moorish conquerors, came up with their own form of sword fighting, based on geometry and philosophy, which revolved around a “mysterious” circle filled with intersecting lines to be traveled upon by the fencer. But this style of combat, for all its declarations of scientific, and even occult, principles, gained little support outside of Spain. Gerard Thibault of Antwerp, spent twenty years writing a volume in an attempt to reintroduce the Spanish method to Europe. Although considered one of the most beautiful fencing books ever produced, by the time it appeared in 1628, the author was already dead, and his book was largely ignored by the rest of the world. Italian masters introduced the rapier to England in the late 16th century, forcing the old English masters, who relied on the cutting sword, to retaliate vigorously against this upstart form of sword fighting. Led by master swordsman George Silver, they put up a valiant, but hopeless, fight against progress. Silver’s book, Paradoxes of Defence (1599), was a stern and detailed reminder that old ways were best. Wrote the Englishman, “…bring me to a fencer, and I will bring him out of his fence trickes with good downright blows, I will make him forget his fence trickes.” But the rapier won out in the end. Poking holes in one’s adversary proved a much more reliable way to end a fight successfully than trying to carve off his body parts. During the 17th century, the French, with their flair for reason and order, produced the first widespread system of point play that was accepted as a fully formed school of fencing thought. This meant that one style could be taught anywhere, and it would be virtually identical in concepts and content no matter who was teaching it. This learned style, so uniform and academic, attracted the likes of the French philosopher Rene Descartes into its ranks. Descartes, a friend and student of famed French fencing master, Charles Besnard, once complained to a friend in a letter that he enjoyed fencing so much, he was falling behind in his studies. As for the aforementioned Besnard, his book, Le Maistre d’Arme Liberal (1653), lead the way to into what might easily be recognized today as a modern fencing form, emphasizing point work above all else, and separating the parry and riposte into two separate actions. Much thought was given, not only to systems of combat, but to perfecting the weapons being used, streamlining them to make them lighter and more evenly balanced. These improved weapons allowed for more intricate and precise maneuverings. From the rapier sprang the small sword, said to be the ultimate in dueling arms. Sleek and minimal in form, with a needle-sharp point, the small sword could be called the “sports car” of fighting tools. Indeed, with this weapon, fencing took on a new look. The speed at which a small sword could be delivered made it necessary to refine both offensive and defensive techniques. Some actions, such as body evasions and parrying with the free hand, were now deemed too dangerous to engage in, while other actions that could never have been accomplished with a much heavier rapier or a cutting sword, were vigorously promoted. Also, more emphasis was placed on the blade as the sole source of defense. In the end, this refining process also gave rise to a radical direction in fencing thought: fencing could be employed for enjoyment as a sport, and for personal well-being and deportment, rather than simply as a martial art. These ideas were first expounded by fencing master Domenico Angelo in his book L’Ecole des Armes (1763), and, later, by his son Harry Angelo. This shift in the emphasis in fencing ironically came at a time when the sword was being rejected as the dueling weapon of choice in favor of the pistol. Much of what we associate with modern fencing springs from this time period. Although fencing was still employed as preparation for the duel in some European circles, by and large, it became thought of more and more in the guise of its more benign incarnation. Through the 19th century, three separate forms of fencing as a sport took shape: foil, epee, and sabre. Each weapon had its own particular style of play, its own character, its own thought process directing its use. And they still do. The foil is the weapon that teaches the fundamental behavior of fencing. The foil has conventions that say, “What if these weapons were sharp?” and guides the fencer along those lines. This delineated conduct is sometimes called, “The Logic of the Sharp Point.” The epee represents the hard realities of the duel. The premise is to hit and not be hit, with the target area extending over the entire body, just like in a real sword fight. The sabre merges the cut and the thrust into an effective fighting form. Like the foil, it is a system guided by rules. These are the traditional ideas of fencing, the sport. The fencing mask was another inventive idea in the stream of fencing’s thought development. Invented in the mid-18th century, the mask was at first spurned by serious swordsmen, who believed this piece of equipment would inhibit personal responsibility for safety based on skill. Fencers prided themselves on skillfully using their blades to keep from harming an opponent on the field of play. Only a poor swordsman would wear a mask or insist that anyone else wear one. Some masters, including the great Angelo, considered fencing masks effeminate, and banned them from being used in their schools. By the early 19th century, however, the mask had lost its early destructive stigma when fencers finally came to realize it enhanced one’s skills, rather than destroyed them, freeing the fencer up to fully exercise his abilities without fear of accidents. By the late 19th century, the changing nature of society forced a new innovation on fencing's self-image, this one of a social nature: women, once excluded from the fencing arena, were finally given the opportunity to fence. Previous to this time, women, for the most part, were thought to be too weak and mentally inferior to be able to carry the demands that successful fencing demanded; although, in their day, the ever open-minded Domenico Angelo, and his son Harry, without discrimination, were teaching women, chiefly actresses, the finer points of swordplay with great success. For the most part, however, fencing masters stubbornly refused to allow women into their schools, which to their way of thinking were the sacred domain of men. But patience and common sense eventually prevailed, and women began to eagerly take up the foil for sport and exercise. Needless to say, they laid claim to their place in fencing, and never looked back. The German fencer, Helena Mayer, who fenced during the first half of the 20th century, is considered one of the greatest fencers of all time. The 20th century produced a number of changes in fencing, some good, some not so good. The Olympic Games and World Championship tournaments generated a new interest in fencing. This led to a need for standardized rules that covered all fencing everywhere. In time, technology was introduced in the form of electrical scoring devices, with the hope of making the recording of touches more accurate. By the late 19th century, the changing nature of society forced a new innovation on fencing thought, this one of a social nature: women, once excluded from the fencing arena, were finally given the opportunity to fence. Previous to this time, women, for the most part, were thought to be too weak and mentally inferior to be able to carry the demands that successful fencing demanded; although, in their day, the ever open-minded Domenico Angelo, and his son Harry, without discrimination, were teaching women, chiefly actresses, the finer points of swordplay with great success. For the most part, however, fencing masters stubbornly refused to allow women into their schools, which to their way of thinking were the sacred domain of men. But patience and common sense eventually prevailed, and women began to eagerly take up the foil for sport and exercise. Needless to say, they laid claim to their place in fencing, and never looked back. The German fencer, Helena Mayer, who fenced during the first half of the 20th century, is considered one of the greatest fencers of all time. Today, fencing thought has split into two distinct camps: sport fencing versus traditional fencing. Sport fencers would have it that their technology-based form of fencing, geared around the electrical scoring machine, is the natural embodiment of fencing in the 21st century. Not seen so much as a school of fencing thought as an attitude, sport fencing has been described as the inspiration of the individual fencer. It has also been called the “ultimate video game.” Sport fencers tend to view fencing, without the technological perks of their approach, as old-fashioned. Traditional fencers, who rely on those skills founded upon precepts firmly established in a martial past, would suggest that the scoring box of sport fencing has become a device for conditioning fencers into an anything for a touch mindset, and a crutch to take up the slack for poor technique, that has dumbed down the competitive game into a running, jumping, twisting, screaming event, about as far removed from true fencing concepts as bowling or ping pong. With all these changes, fencing thought has fluctuated greatly over the years, sometimes guided by nationalistic notions, sometimes political, and most certainly with an underlying commercial interest. Then, from all this, a yearning for traditional values might erupt. Fencing obviously has a life of its own. It boldly molds itself, constantly testing its boundaries. There is even a schizophrenic quality to be considered. Sometimes egocentric and common, other times noble and uplifting; sometimes beautiful and controlled, other times ugly and brutal; sometimes a way of life, other times a game so shallow as to warrant little serious attention, fencing is and has been, and is not all these things, depending on how it is viewed. So, is fencing just a shallow sport, or is it a method by which we can discover subtle truths about ourselves? A life skill, perhaps? That is for the individual student of fencing to discover. © Text revised and enlarged, with new illustrations, from Nick Evangelista's Inner Game of Fencing (2000).